Fashion Editor Barbie was an FAO Schwartz Exclusive doll released in 2001. This Limited Edition Silkstone Barbie, part of the Fashion Model Collection is wearing a black Boucle coat, a black turtleneck shell and a leopard print short slim skirt. She also has black shoes and stockings. Her accessories include bold black eyeglasses, a black hairband hair ribbon and a black purse with gold chain straps. She also has stud earrings and is wearing a gold bracelet. She has a Barbie sized invitation and a Fashion Show invitation. She has short red hair, blue eyes, blue eyeshadow and red lipstick. 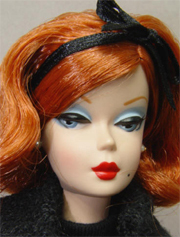 This is the first of the doll in the series, the second was the 2002 Fashion Designer Barbie.